Floral arrangements from across the four seasons were on display at the Kilmore and District Hospital’s closing ceremony for Floraid on Friday, October 13. Kilmore Hospital CEO Sue Race, Member for Northern Victoria Jaclyn Symes, Member for Euroa and Deputy Leader of The Nationals Steph Ryan and Deputy Mayor Cr David Lowe were in attendance at the event to recognise the hard work of all involved. Hosted in partnership with the Mitchell Shire Council during the 2017 Victorian Seniors Festival, Floraid provided the community with a visually stimulating event and celebrated seniors living within the shire. 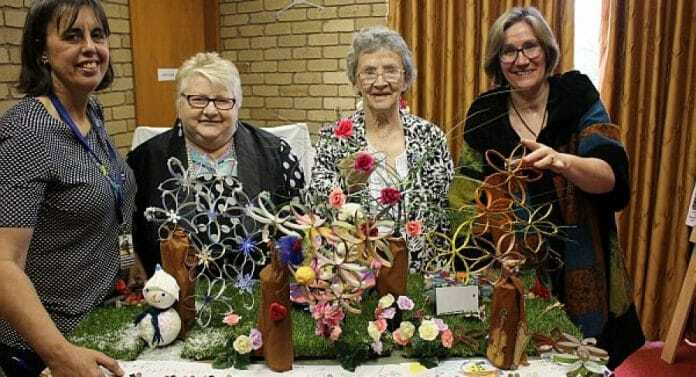 Led by the staff at the Kilmore and District Hospital, Floraid invited community groups to make a colourful and unique display of flower art – from non-perishable materials – representing one or more seasons of the year for the event. On August 28, Floraid was officially opened by Member for McEwen Rob Mitchell at Caladenia Nursing Home. The displays were then rotated at Dianella Village Hostel in Kilmore and Karingal Nursing Home in Seymour, so residents and families could view the works and share in the experience. Council also showcased the displays across all three libraries in Broadford, Kilmore and Wallan. Together, the community groups created a spectacular display for all seniors living in the Mitchell Shire to enjoy, showcasing an active older community.